When you’re traveling for business, being able to get online can be crucial to getting work done. That’s why it’s important to know your Wi-Fi and cellular options at the airport before heading out on a work trip. Speedtest recently released its list of major airports across North America, exposing their Wi-Fi and cellular capabilities. By comparing and analyzing Wi-Fi and cellular speeds, measured by megabits per second (Mbps), at 30 of the busiest airports on the continent, Speedtest reveals whether you should use Wi-Fi or a cell network to get online. When it comes to Wi-Fi, Denver International Airport offers the quickest Wi-Fi across all surveyed airports. However, that’s not the case with cellular. The airport that offers the best cell service is the Toronto Pearson International Airport. While a majority of airports throughout the U.S. offer better Wi-Fi to travelers, airports in Canada tend to feature better cellular service. At airports in Mexico and Central America, people can forget about Wi-Fi altogether -- a majority of these airports don’t even offer coverage, so people have to depend on cellular. So if you’re traveling for business soon, here is some info that will help you prep. The airport in Denver doesn't just boast the fastest Wi-Fi in the nation, but on the planet. And according to Speedtest, its rate actually improved nearly a third over last year's speed. Although it’s a close call, travelers might get a little better service when using cell data rather than hooking up to Wi-Fi. Vancouver Airport comes in first place for fastest cell service, and second place for fastest Wi-Fi. Travelers shouldn’t even think twice about using Wi-Fi over cell service at the airport in Philly. The free Wi-Fi at this airport is the third fastest across all 30 surveyed airports. However, it falls to 24th place when it comes to cell service. Here’s an airport that not only boasts free Wi-Fi, but quick Wi-Fi. 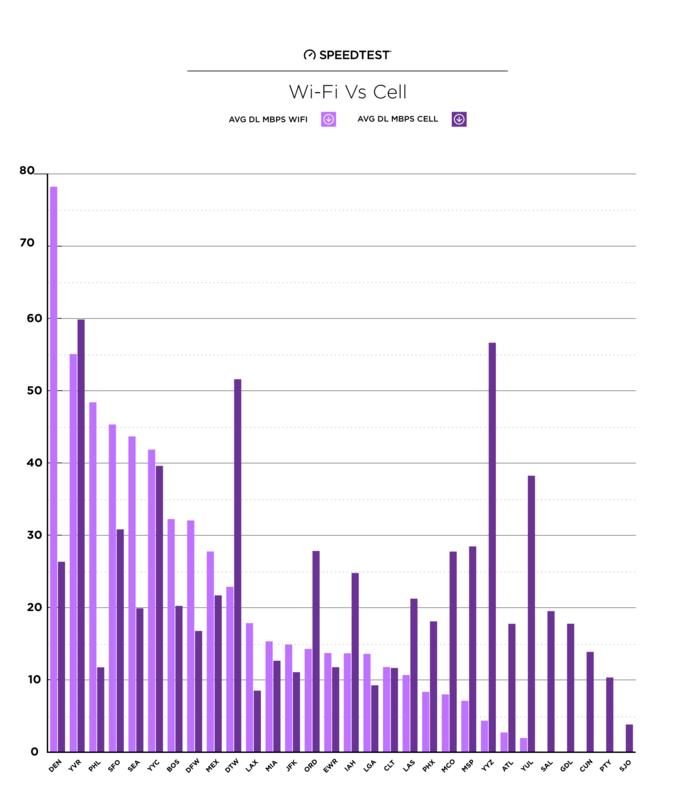 Over the past six months, the San Francisco International Airport has seen a major improvement in its Wi-Fi. When it comes to download speeds through Wi-Fi, the airport saw a 718 percent improvement since January, according to Speedtest. Like San Francisco, here’s another west coast airport that offers fast and free Wi-Fi. And if you’re deciding whether to use your own cell data or hook up to the public Wi-Fi, you might want to choose the latter. Wi-Fi at the airport in Seattle is more than twice as fast as cell service. This Canadian airport has a close contest between Wi-Fi and cell service. Travelers can hook up to the internet through either, although they might notice the Wi-Fi to be a bit faster. The average download speed over Wi-Fi is 41.83 Mbps, while it’s 39.59 Mbps over cell, according to Speedtest. Forget about using cell service at Boston’s Logan International Airport, and instead stick to Wi-Fi. According to Speedtest, over the past six months, downloading speed through Wi-Fi has improved by a whopping 283 percent. At Dallas/Forth Worth Airport, Wi-Fi is nearly twice as fast as cell service, so if you’re passing through this Texan state -- make sure to hook up to the free Wi-Fi. Even outside the U.S., Wi-Fi seems to overpower cell service at a number of airports. In fact, if you’re looking to hook up to the best Wi-Fi in Mexico City, you might want to head over to the city’s Benito Juarez Airport. The Wi-Fi at this airport is 87 percent faster than Mexico’s country average of 14.81 Mbps. Here’s the first U.S. airport on the list to offer better cell service than Wi-Fi. In fact, the Detroit Airport has the third fastest cell service at an airport in North America. Cell speed is more than double as fast as Wi-Fi speed. If you’re traveling through this southern California airport, don’t even bother trying to connect to the web over cell service. The average downloading speed through cell service at LAX is a low 8.47 Mbps, while it is 17.82 Mbps through Wi-Fi. Unfortunately for travelers at the Miami Airport, Wi-Fi speed saw a slight drop over the past six months, according to Speedtest. However, it’s still a better option than depending on the cell service. This New York City airport is also not the best when it comes to Wi-Fi or cell service. However, if you need to get on the web, your best bet is through Wi-Fi. Wi-Fi downloading speeds at JFK is 14.86 Mbps, while it is 11.03 Mbps over cell. Over the past six months, Wi-Fi speed saw a significant drop at this midwestern airport, making cell service a much better choice for travelers at Chicago O’Hare. In fact, cell service is almost twice as fast as Wi-Fi. Although Wi-Fi speed in this tri-state area airport also saw a drop over the past six months, it’s still a better option than using cell service. On average, when it comes to downloading over Wi-Fi, Newark Airport has a 13.86 Mbps speed, and 11.72 Mbps over cell. There’s no question that travelers should depend on cell service when it comes to getting on the web at the George Bush Intercontinental Airport in Houston. Cell speed is twice as fast as Wi-Fi at this Texas airport. Another airport where travelers can expect to have trouble getting on the web whether through cell data or Wi-Fi is New York’s LaGuardia Airport. However, between the two, Wi-Fi is the winner. LaGuardia’s Wi-Fi speed is 13.57 Mbps and its cell speed is 9.21 Mbps. It’s pretty much a tie when it comes to using Wi-Fi or cell service at the Charlotte Airport. In fact, there’s only a 0.13 Mbps difference between the two. If you’re traveling through this airport in the desert, don’t expect to depend on the Wi-Fi. The cell speed at Las Vegas’s McCarran International Airport is twice as fast as its Wi-Fi. Over the past six months, Phoenix’s international airport saw double-digit improvements in its cellular speed. Today, it boasts a cell speed of 18.06 Mbps, and only 8.31 Mbps through Wi-Fi. If you’re passing through this Florida airport, it’s important to know that you’re much better off using your cell service than hooking up to the airport’s Wi-Fi. Even though Wi-Fi speed increased by 124 percent over the past six month, cell service is still nearly three times faster than Wi-Fi at the Orlando Airport. Another airport where cell speed is three times as fast as Wi-Fi is Minneapolis-St. Paul International Airport. And while the Wi-Fi might be free, you’re better off sticking to cell data. Don’t even consider hooking up to Wi-Fi at Canada’s Toronto Airport. The airport has average Wi-Fi download speeds of 4.31 Mbps, but it offers a cell speed of 56.63 Mbps, making it the second best airport with the fastest cell service. This southeastern airport is another spot travelers shouldn’t expect to get great Wi-Fi. The Wi-Fi downloading speed at Atlanta International Airport is a low 2.68 Mbps -- however its downloading speed over cell is 17.72 Mbps. Wi-Fi at Canada’s Montreal Airport is basically non-existent. However, its cell capabilities are superb -- landing it number five on the list of top airports with the fastest cell. There’s no competition here -- Monsenor Oscar Arnulfo Romero International Airport in San Salvador, El Salvador, doesn’t even have Wi-Fi, so if you need to get on the web, you’ll have to depend on cell service, which has average download speeds of 19.48 Mbps. There’s no Wi-Fi at this Mexican airport either, so travelers will have to depend on the cell service there, which features download speeds of 17.74 Mbps. Another Mexican airport that doesn’t have Wi-Fi is Cancun International Airport. And with cellular download speeds of 13.84 Mbps, travelers should take caution that getting on the web won’t be too easy. Panama City’s Tocumen International Airport is another airport in Central America that doesn’t offer Wi-Fi. Not only that, but its cell capabilities are also on the slow side. If you’re traveling through Costa Rica’s Juan Santamaria International Airport, it’s important to plan ahead. While this airport doesn’t offer Wi-Fi, its cell speed is also extremely slow, at 3.79 Mbps.